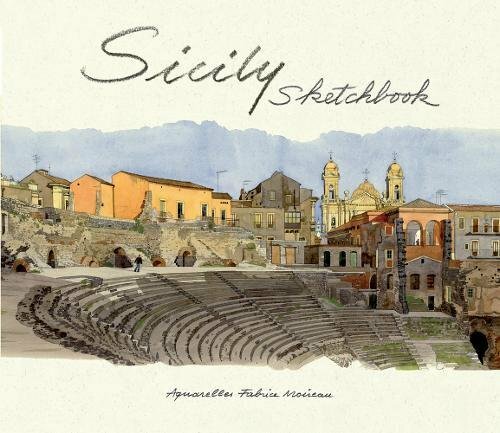 Sicily Sketchbook is another stunning book from Fabrice Moireau, the artist architect who already has so many amazing books under his name. I'm not just a big fan of his work, but I'm also extremely jealous he gets to visit and paint all those places. The format of this book is just like others published by Editions Didier Millet. This is a large 96-page hardcover book. As usual, they used watercolour-like paper for printing so the reproductions of watercolour and sketches just look so good. Fabrice Moireau is such a masterful watercolour artist. I can stare at his paintings for hours. The artworks in this book are not just beautiful, they also evoke a sense of wanderlust. You may also notice that the cover art on my copy is different from the so called official cover art. I'm not sure why that is so. At the time of this review, this book is cheaper (~US $24) on Book Depository and includes free shipping. That's where I bought mine.